A very lucky passing photograph at Brookfurlong Farm (between Islip and Oddington) on 20 October 2015. 168110 heads south with a Chiltern Railways driver training special, passing 168325 heading in the opposite direction with a similar train. Despite numerous available paths, several trains were not running to time, and yet these two trains did not seem to appear on Realtime Trains. They could possibly be the 5T10 10:38 Bicester Gavray Junction to Oxford Parkway, and the 5Y12 10:53 Oxford Parkway to Bicester Gavray Junction, but these were both being shown as cancelled! 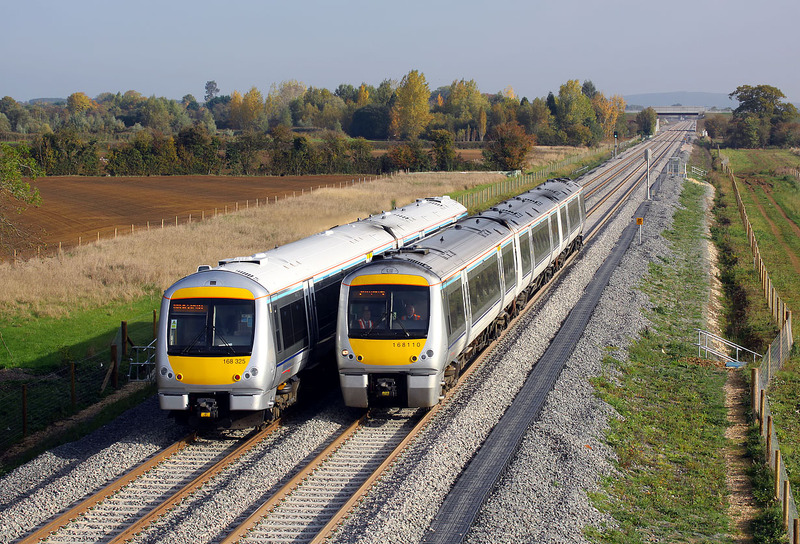 This is the final week of driver training on the revamped Oxford to Bicester line, with a new direct service to London due to commence on 26 October.